The Ledgo V58C-1K1 is a bi-colour ultra soft light with a colour temperature range of 3200K-5600K. 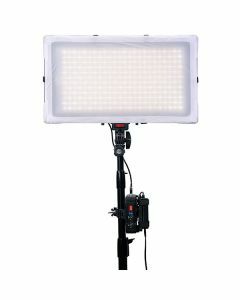 The V58C-1K1 has a flexible design and can be used as a lighting wrap, its waterproof and can be used in the cold, rain or snow, and its easily portable. The soft light comes with a quality, anti-wrinkle diffuser cloth and is supplied in a soft case. You can control the light over wifi via the Ledgo mobile app.